Morgan Hill, California, is a popular destination for visitors who want to be nearby multiple major cities, but without the hustle and bustle of busy city life. This makes it the perfect destination for business travelers who also want a respite from their busy workday. Nearby dozens of local restaurants, wineries, hiking trails, golf courses, retail shops, and other local attractions as well as being a short drive from Monterey, San Jose, San Francisco, and other popular Bay Area cities, Morgan Hill is an ideal location for all visitors. Enjoy the rolling hills, great weather, and friendly community. During your stay, be sure to visit 88 Keys Cafe & Piano Bar. Whether after a long day at work, or after a day of golf and touring local wineries, the best way to end the evening is at 88 Keys Cafe & Piano Bar. 88 Keys Cafe is a hidden gem and a favorite among locals. Slightly upscale, enjoy classic traditional American cuisine, the cocktail bar, and live music performances. Begin your meal with crispy fried dill pickles for a perfect sweet and savory balance served with a house-made ranch dressing, or sample The Platter - cured meats, grapes and a wide assortment of olives, nuts, and cheeses with a garlic aioli dipping sauce. Seafood lovers should sample the shrimp scampi (with mushrooms and dried tomatoes) or crispy calamari rings (served on a bed of arugula and a delicious chipotle dipping sauce). Enjoy a mouthwatering beet salad with arugula, apples, walnuts and a homemade orange vinaigrette. A juicy 12oz melts-in-your-mouth Angus steak with seasonal vegetables and garlic mashed potatoes, Chicken Cordon Bleu stuffed with cheese and sliced ham, baked to perfection in a light alfredo sauce and served with a mixed greens salad, or enjoy succulent salmon, grilled to perfection and topped with a lemon caper sauce, served with seasonal vegetables and garlic mashed potatoes. Pasta lovers should definitely order the tortellini carbonara - hand rolled tortellini’s sauteed with peas and bacon in a creamy house sauce served with fresh garlic bread and sauteed seasoned vegetables. And don’t forget to save room for dessert. Local favorites include the raspberry pannacotta, chocolate truffle torte, and tiramisu. Stop by daily from 4-7pm for Happy Hour and enjoy half-priced alcoholic beverages and specialty cocktails, in addition to half-priced appetizers. This is a wonderful opportunity to sample all of your favorite menu items without breaking the bank. Each night at 88 Keys Cafe & Piano Bar offers a special live performance for guests. Stop in for a fun surprise, or browse the event calendar online to plan your best evening. Bring your friends and come in for football viewing on a gigantic 12 foot screen, enjoy live piano performances by one of the owners (and a sale on the infamous meatloaf entree! ), or enjoy other artists and performances including: Al Putman Smooth Jazz Piano, Derek and Friends Jazz, Rock, R&B & Soul, David’s DJ and Karaoke night, or DJ Mike, or The Poppy Jasper Trio for Classic Rock, Jazz and Blues, to name a few. There is truly something for everyone at 88 Keys Cafe. 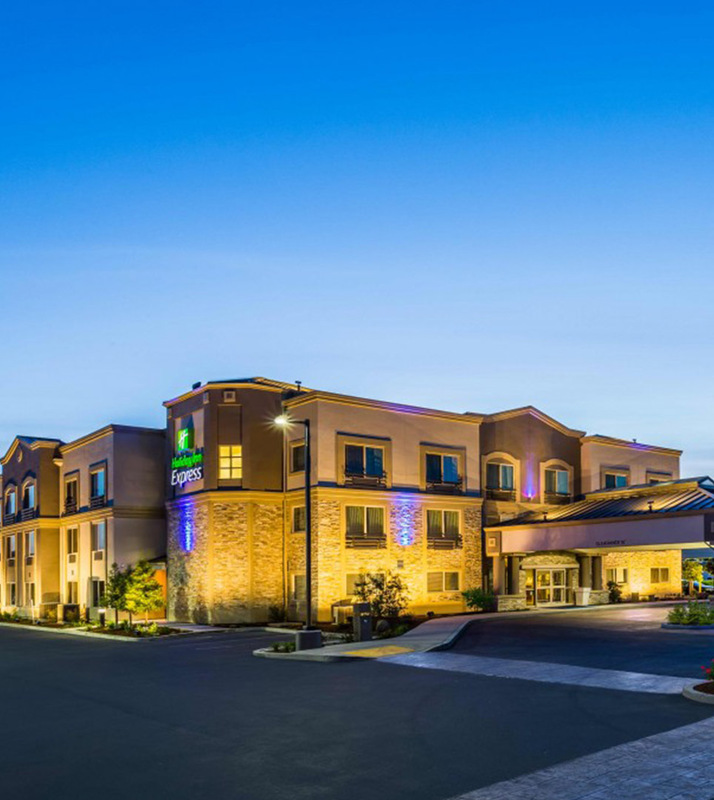 Conveniently located approximately twenty minutes from the technological hub of the Silicon Valley and offering guests clean, spacious rooms, friendly staff, modern amenities, an indoor heated pool and sauna, fitness center, business center, atrium, breakfast bar, and the perfect venue for private events, Holiday Inn Express Morgan Hill is the perfect choice for business and leisure travelers. Specials and Packages are widely available. Book direct for lowest rates at www.hiemorganhill.com.